The design of this powerful 3 bands semi-parametric equalizer is derived from previous models SX-S and SX-ST whose effectiveness and sonic transparency has been proven on the field for decades. These filters have a shelve curve. 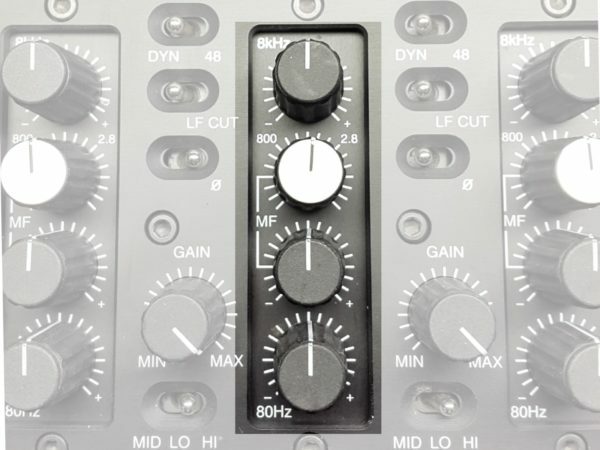 Bass and treble adjustments are controlled by the [80Hz] and [8kHz] knobs with a range of +/- 15dB. 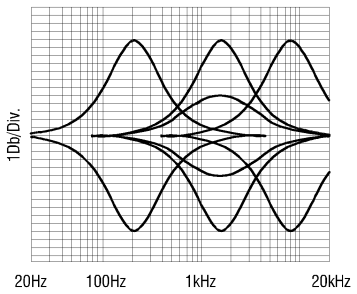 Semi-parametric (sweep frequency) equalizer with a broad fixed bandwidth. The upper knob progressively adjusts the central frequency from 200Hz to 8kHz, the lower knob adjusts the gain of the filter.